Hanalei Bay lies on the north shore of Kauai beneath 4000 foot towering, green and ancient volcanic mountains and spectacular shimmering waterfalls. With its stunning two-mile long crescent-shaped beach of warm golden sand and blue Pacific waters, Hanalei Bay is a must see on any trip to Kauai. In spite of the fact that the beach is always rated in the top 5 beaches in America, it still feels undiscovered. Undiscovered at least from the crowds and commercialism you'd expect from a place as wonderful as this. It's laid back and relaxing. The people on the north shore like it this way. Sit on the beach for 5 minutes and you'll understand why. Stay 5 days and you won't remember why life has to be any other way. 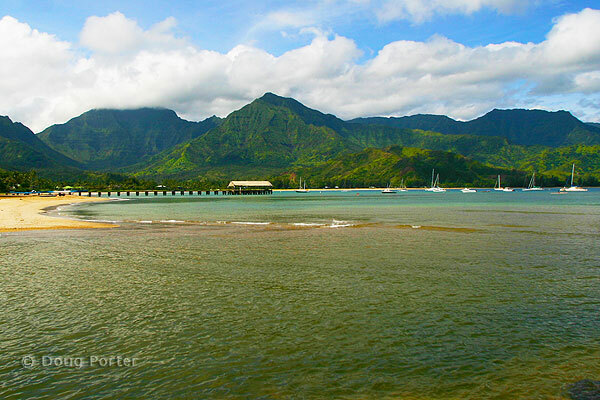 The Pier in Hanalei was first built in 1892 to support the then thriving rice industry. Its scenic location near the mouth of the Hanalei River and Black Pot Beach has long been a favorite family gathering place for fishing, picnicking, swimming, and playing. (More information about Hanalei Pier). Hanalei Town is located just a short walk off the beach. Here, you'll find surf shops, restaurants, boogie board and snorkel rentals, shaved ice, a grocery store, a couple of health food stores, and a couple of churches lining the two lane road that runs through town. Surfing is popular here and like anywhere else, varies greatly by season and ocean conditions. Waves are generally smaller in summer and the shallow water near the beach and along the pier is a great place for those learning to catch their first wave. Stand Up Paddleboarding is also very popular in the bay and mouth of the river. The surf generally gets bigger in winter months and when it does you'll likely see the experts further out catching big waves. Here's a great video of Laird Hamilton doing some stand up paddle surfing on Hanalei Bay. On April 6, 1824, King Kamehameha II's royal yacht, HA`AHEO o HAWAI`I (Pride of Hawaii), sank on the southwest corner of the bay near the mouth of the Waioli River, after striking a five-foot deep reef a hundred yards offshore. A large section of the ship's hull washed ashore in 1844 in a winter storm surge but most of this historic wreck remained buried in silts in the bay. Between 1995 and 2000, archaeologists from the Smithsonian Institution's National Museum of American History excavated the wreck and recovered more than 1,200 artifacts. During this excavation, a 40 foot section of the stern was discovered, documented, and then re-buried where it was discovered. There are a number of vacation homes and cottages along the bay ranging from small cottages to large and more spectacular beach houses. Hanalei Bay Resort and the Princeville St. Regis Hotel share the same beach on the northeast corner of the bay but are actually located in the community of Princeville.